Office Depot Brand Weekly/Monthly Planner, 8 1/2in x 11in, Black, January To December 2019.Planner,Wm,Od,Ry19,8X11,Black2 pages per week/month. 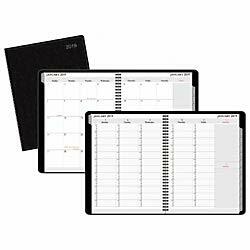 Past and future reference calendars help you organize future events. Quarter-hourly appointments from 7 a.m. to 6 p.m. help you keep each day tightly organized. Notes pages provide space to jot down reminders and contact information. 12 months: January to December. Wirebound pages have a vinyl cover for added durability. If you have any questions about this product by Office Depot, contact us by completing and submitting the form below. If you are looking for a specif part number, please include it with your message.